Mercury is a naturally occurring metal that is ubiquitous in the environment. The major source of atmospheric mercury has been reported to be global degassing of mineral mercury from the lithosphere and hydrosphere at a rate of 2,700-6,000 tons/year (WHO, 1990). Estimates on anthropogenic releases of mercury to the atmosphere normally ranged from 2,000 to 4,500 tons/year (WHO, 1990). Furthermore, weathering of mercury-bearing minerals in igneous rocks is estimated to release about 800 tons of mercury per year to surface waters on a global base (WHO, 1990). Western guidelines, suggest that natural Hg levels are 1-3 ng / m3 in air, 1-2 ng / l in the dissolved phase in surface waters, 2-25 ng / l in rainwater and less than 100 ng / g in sediments remote from natural Hg mineral deposits and wastewater sources (Porcella et al., 1997). Furthermore, average mercury concentration in most fish is less than 0.2 µg/g (USDHH, 1994). The area of interest is the Amazon region of Brazil. 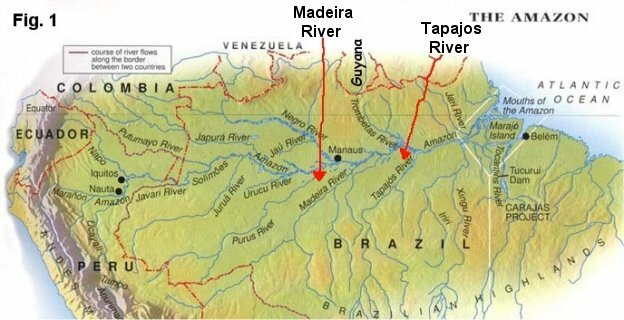 I will mainly focus on two areas of the Amazon, the Tapajos River and Madeira River (Fig. 1). River samples from the Madeira and Tapajos River were taken downstream from gold mining areas.